Taste test: These are among the best vinegar chips anywhere. 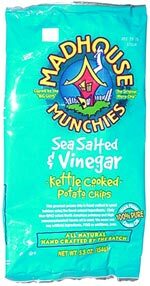 They've got tons of vinegar taste, combined with delicious sea salt, on a very crunchy chip. They're outstanding. They might have set the all-time record for the shortest lifetime in the office chip bowl  before you could blink, they were all gone. Smell test: Very strong vinegar aroma  watch out! 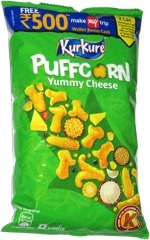 The bag you are holding contains the finest gourmet potato chips this side of heaven  or Vermont, for that matter. Every Madhouse flavor starts in my Vermont kitchen, and is thoroughly taste-tested among friends, family, neighbors  and the occasional bystander  before becoming an official Madhouse Munchies kettle chip.